"The largest of the Norwich breweries". The brewery of James Beevor (86 Magdalen Street) was bought out by John Patteson in 1784. That of Charles Greeves at Pockthorpe was sold in 1793 to John Patteson. By c1795 the brewery of Jehosophat Postle had been acquired. In 1797, HRH Prince William Frederick had lunch at the Pockthorpe Brewery, in a large newly manufactured vat. 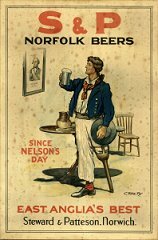 By 1800 the Gt Yarmouth North Quay Brewery of Fisher had been added to the business. along with his son Timothy Steward the younger. In 1831 the brewery of GEORGE MORSE was amalgamated with S,P&S. 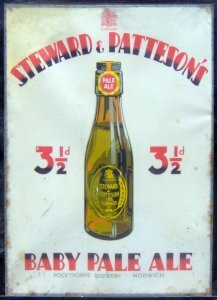 The brewery became STEWARD, PATTESON & Co.
26 September 1837 this brewery merged with that of Peter Finch. STEWARD, PATTESON, FINCH & Co was born. On Thursday 11th June 1857, a dinner was given to the workmen and their wives, to celebrate the completion of a very large store, capable of holding a thousand barrels. Some 400 persons attended the dinner which was held in the gaily decorated new store. Mr. Steward, the senior member of the firm, presided. His partners, Mr. H. S. Patteson and Mr. C. Morse sat with him and Mr. Chancellor Evans, Mr. J. B. Morgan, Mr. Arthur Steward, Mrs. Steward, Mrs. Patteson sen., Mrs. H. S. Patteson and several of the younger branches of the Steward family and a few personal friends attended. 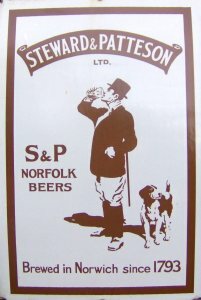 Registered as a limited company July 1895, the brewery became STEWARD & PATTESON Ltd. 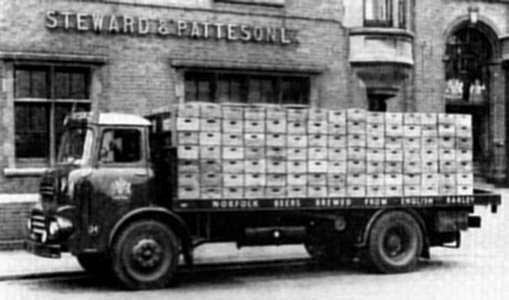 The same year the Swaffham Brewery of Morse & Woods, with 51 houses was purchased. 126 houses were closed following the 1904 Compensation Act. Holders of the Royal Warrant from 1934. In 1938 branches were listed at Gt Yarmouth, Kings Lynn, Ipswich and Eye. 632 tied houses in 1961. The area covered was from the Essex borders to Lincoln. finally selling in February 1967 for £7,666,270. Last beer brewed on site January 1970. Brewery site encompassed 12 acres.